Home / Bathing / Join the bath challenge! I saw this picture on Pin-Interest and had to share it. 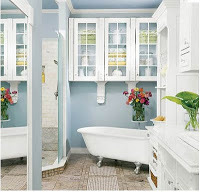 I have always dreamed of having a clawfoot tub in my bathroom and hopefully one day that will happen or a garden tub. But a tub big enough to spread out and relax and not have my knees under my chin so much. :o) So I am dreaming of this tub ! But I do have lots of candles and music and take that time when people are out of the house to grab the tub while all is quiet for some very important me time! What sorts of baths do you have and what is your bathtime like? I would love to have some feedback and hear what you all have to say with a picture of your bath and one that you love. I am getting excited about this. How about a challenge for the best bath story and we can start it next Monday 1/23 and end it 2/6. The winner will receive a jar of Lavender Bath Soaking Salts and a bar of Lavender Soap. Are you game ? Congratulations on your first blog post! My best bath story is from when I was pregnant. I have the best baths back then. My husband and I would actually have our business and household meetings in the bathroom so I could be in the tub soaking and relaxing my pregnant body while we worked. If I had a pic from back then, I’d definitely share. I look forward to seeing your contest and blog evolve. Fun!